A team of Virginia Tech researchers have discovered fossils of kinorhynch worms – commonly known as mud dragons – dating back more than 530 million years. The historic find – made in South China – fills a huge gap in the known fossil record of kinorhynchs, small invertebrate animals that are related to arthropods, featuring exoskeletons and segmented bodies, but not jointed legs. The first specimen was unearthed in rocks in Nanjiang, China, in 2013 and more fossils were found later that year and in 2014. 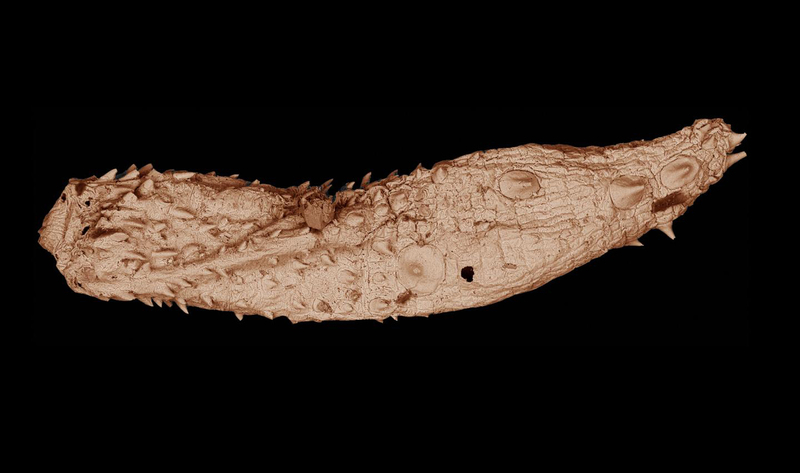 Helping lead the international team of scientists and biomedical engineers who unearthed, studied, and imaged the ancient, armored, worm-like creature is Shuhai Xiao, a professor of geobiology in the Department of Geosciences, part of the College of Science at Virginia Tech. Dubbed Eokinorhynchus rarus – or rare ancient mud dragon, the newly discovered animal dates back from the Cambrian period and contains five pairs of large bilaterally placed spines on its trunk. It is believed to be related to modern kinorhynchs. The group’s findings were published in Scientific Reports, a Nature family journal. Xiao added that the new fossil can tell scientists more about how and why body segmentation evolved many times among not only arthropods, but several other groups of animals. Scientists believe kinos and arthropods should have evolved more than 540 million years ago. More so, the authors found that E. rarus has a number of similarities with living kinorhynchs, suggesting a close evolutionary relationship. Similarities between the fossils of E. rarus and living, modern kinorhynchs include their hollow spines arranged in a five-fold symmetry and their body segments each consisting of articulated plates. However, E. rarus differs from modern species with more numerous segments. Hence the belief of an ancestorship. There are approximately 240 living kinorhynch species, all found in marine environments. The body of kinorhynchs is divided into three sections: a head, which includes a mouth cone with teeth; a neck; and a trunk with 11 segments. These creatures could provide clues to origins of body segmentation, but such efforts have been hampered by a lack of well-preserved kinorhynch fossils, until now, said Xiao. The found specimen is 0.078 inches in length and l0.02 inches in width, roughly half the size of a grain of rice, said Xiao. The discovery and resulting research is a collaborative effort with Xiao’s geosciences department, the Virginia Tech College of Engineering, the Chinese Academy of Sciences, and Chang’an University in Xi’an of China. On the team are Drew Muscente of Allentown, New Jersey, and a doctoral student in geosciences; Guohua Cao, an assistant professor, and Hao Gong of Fuzhou, China, a doctoral student, both in the Virginia Tech Department of Biomedical Engineering and Mechanics; Huaqiao Zhang, Xunlai Yuan, and Bin Wan, of the Chinese Academy of Sciences; and Yunhuan Liu and Tiequan Shao, both professors at Chang’an University who were visiting faculty at Virginia Tech while most of the study was carried out. The first kino fossil was unearthed by Zhang. “He sent me an image of the fossil for identification. I immediately recognized it as something very similar to modern kinos,” said Xiao. Xiao studied the specimen using an X-ray micro-CT located at the Virginia Tech Corporate Research Center. Meanwhile, Liu discovered additional specimens in her collection of fossils. “We used electron microscopy to thoroughly image the fossils’ surface features, and then the microCT to scan their interior structures, including their midguts,” said Muscente, who devised an X-ray transparent plastic grid to secure the specimen during examination. He also collected with Gong microCT data that were used in generating the microCT reconstruction. “Because this suite of data is so comprehensive, it includes pretty much everything you can know about the morphologies of the fossils,” he said. Xiao and his team believe more specimens will be found. “Future discovery of additional kino fossil will offer important insights into the early evolutionary history of this group of tiny and little-known animals,” he said.